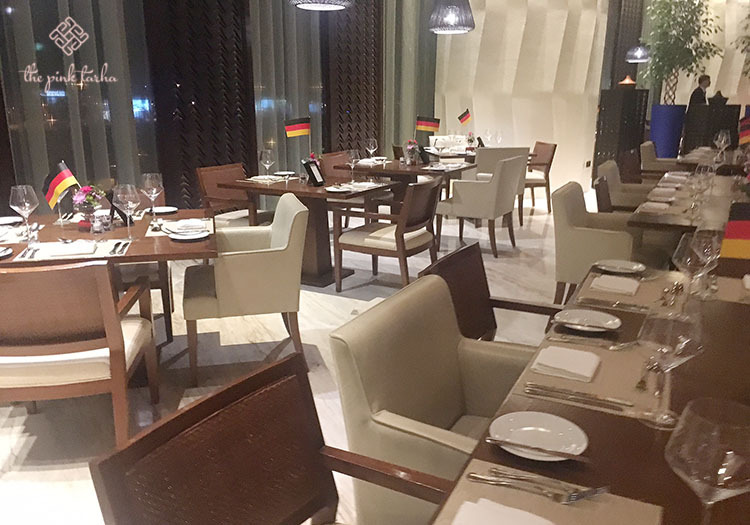 Burj Rafal Hotel Kempinski is currently hosting the German Food Festival in the Aroma Restaurant and we were privileged to be a part of their official opening last Wednesday night. 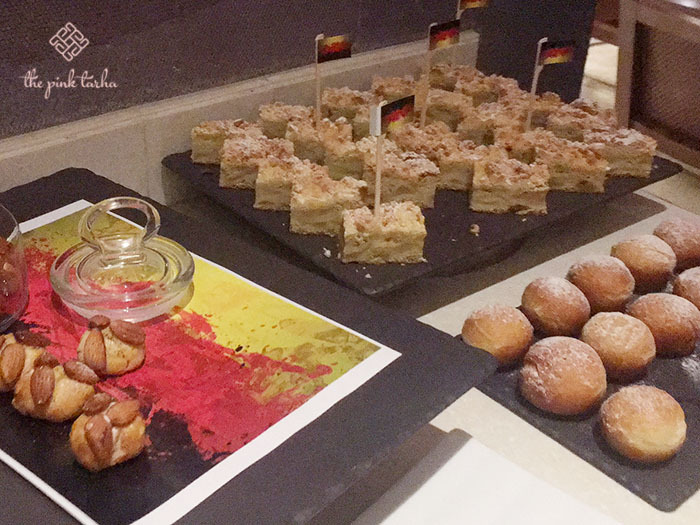 Kempinski is a German brand of luxury hotels, so it made perfect sense to have the German Food Festival there. 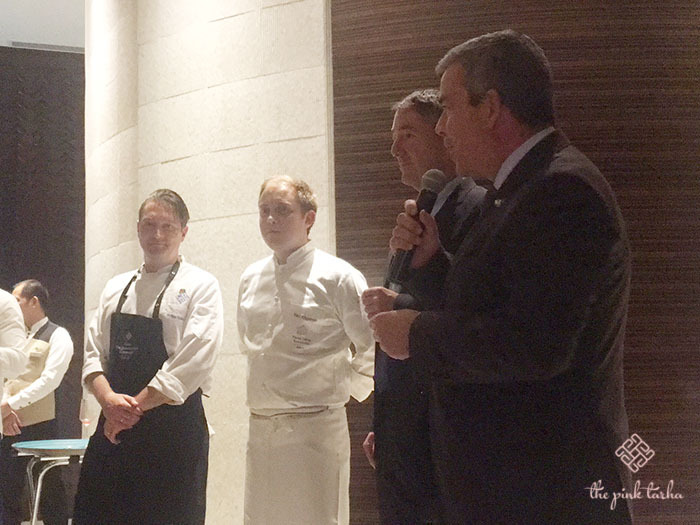 They invited Chef Rico Kaegebein from Hotel Adlon Kempinski, Berlin as the guest chef for the week-long celebration which followed the recent 120th year Anniversary of the hotel’s existence. Chef Rico (in all white), with the German Embassy Deputy and Hotel Kempinski staff. The opening night was graced by numerous diplomats, especially by the representatives of the German Embassy here in Riyadh, along with members of the press. We started off with cocktails and hors d’oeuvres at the lounge area that was decorated with German flags and a whole lot of reading material about Germany’s history and culture, which were a pleasant read while waiting for the ribbon-cutting ceremony to start. Once the formalities were done, we finally got to head on over to the buffet and discover what German food was all about. We were fortunate enough to interview Chef Rico during our Facebook Live coverage, which you can view here. We were unable to take photos of the hot dishes but the Facebook video covered it. 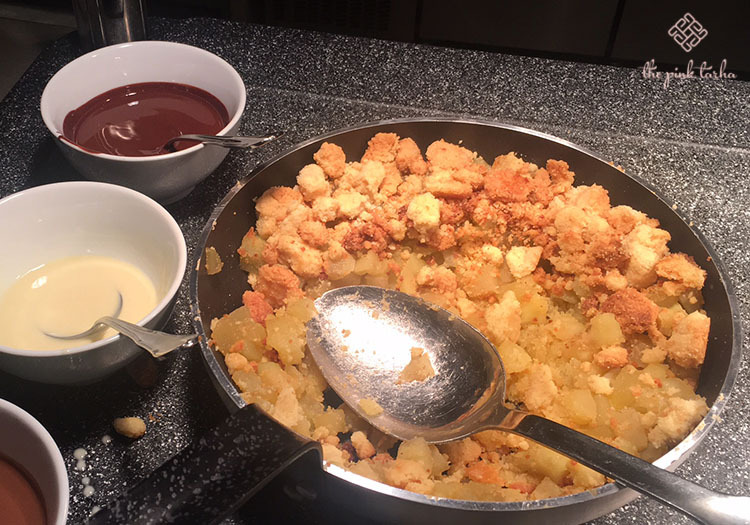 Nonetheless, the main dishes were comprised of signature German dishes such as the Schintzel, Maultasche, Potato Salad, Sauerkraut and many more. I can tell that most of the prominent ingredients in German food were cabbages, potatoes and meat. I was looking forward to see if they would feature some of their famous sausages, such as the Bratwurst but unfortunately, I found none. 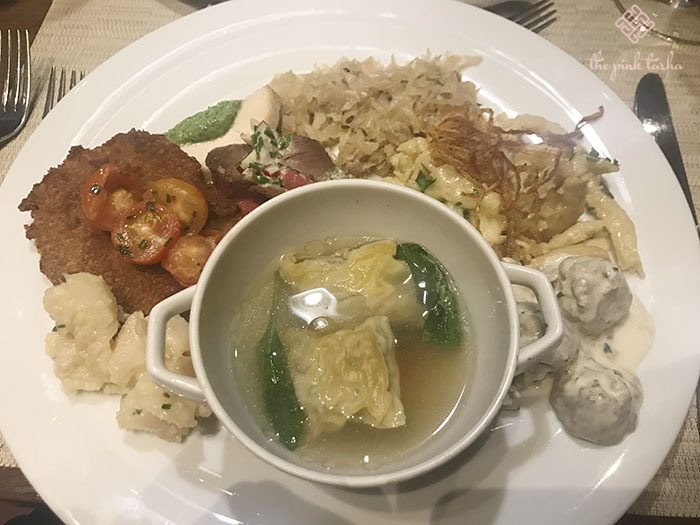 From the left, clockwise, is the potato salad, Schnitzel (fried, pounded meat coated with breading), braised chicken with and herb-like pesto sauce, Sauerkraut (fermented cabbages), Spätzle (German egg noodles) and meatballs with white sauce (possibly called Königsberger Klopse). The soup in the middle is a meat-dumpling soup (possibly called Knödelsuppe). Overall, I would say that their dishes require an acquired taste. It is after all, a cultural experience and tasting their food will give you an insight on what their tastebuds are like. On my plate, what I particularly enjoyed were the potato salad, Spätzle, Königsberger Klopse and the Knödelsuppe. The soup reminded me of something we have in the Philippines too, called the “Molo-Molo” which is made of beef dumplings in clear yet richly flavorful broth. The Spätzle is an experience that makes you wonder, is it pasta or is it bread, who knows? When my bite was paired with the deep fried onions, it made better sense. As for the Sauerkraut, I should have expected it to be sour as the name already implied (I’m allergic to sour food in general). Again, it must be an acquired taste thing. 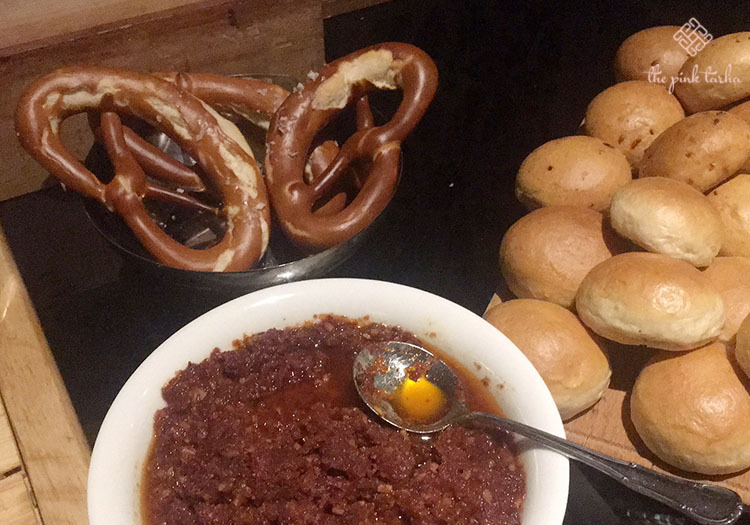 Pretzels are a German staple food. Will the real Streuselkuchen please stand up? By the way, they also served drinks that were of the German brand, like Holsten and Gerolsteiner. Otherwise, the juice they served were in the colors of the German flag: Mango and Strawberry. 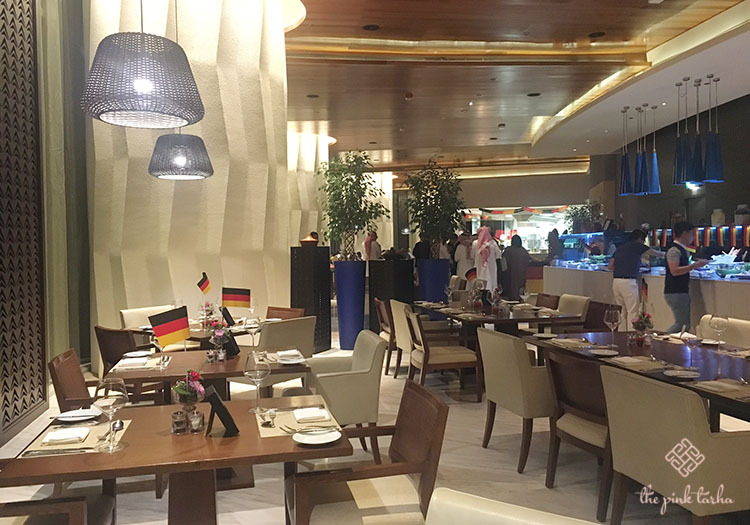 The German Food Festival is ongoing until May 2 at the Aroma Restaurant of the Burj Rafal Hotel Kempinski. The price is 190SAR per person and dinner starts by 6:30 PM til 11:00 PM. Hurry on and head over there to catch it while you still can.